The Great Coat And Tie Experiment: Brown and Blue? I've seen arguments back and forth over the mixing of brown and blue before. Some people like it, some don't. I thought I'd try it and see but I flip-flopped what I would normally do. I went with a brown sportcoat (the same Lands End "sportcoat" as Sunday's gray but in a brown) instead of a navy and navy trousers instead of some shade of brown. I still don't know if I like the conglomeration or not. It was worth a try, anyway. The necktie has brown and blue, doesn't it? The dress shirt is the same shirt I wore on the second day of the blog. 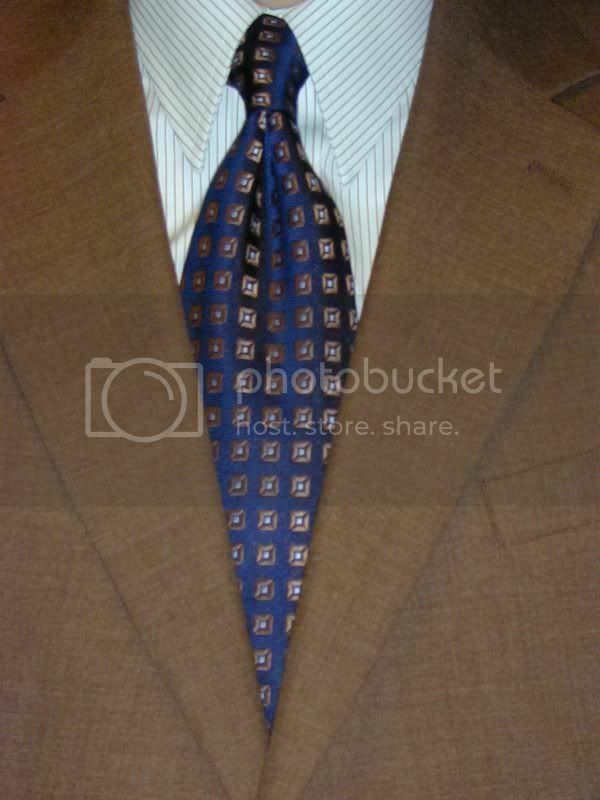 It's a broadcloth, straight collar with brown stripes. Rounding out the conglomeration is an Ike Behar necktie. The background is navy. The squares are brown and match the dress shirt's stripes pretty well. They match the color of the sportcoat fairly well too. The inside of the squares is a light blue color. Another Ebay purchase and another four-in-hand knot. Maybe one of these weeks I'll dedicate each day to a different tie knot.